Vermont Vacation Rental. 5 Minutes to Stratton! Beautiful condo located 1 mile from Stratton Access Road. Also located 15 minutes from Bromley, 20 minutes from Manchester for shopping, 30 minutes from Okeemo. This is a great location for all 4 seasons. Close to trails for hiking, kayaking and numerous other outdoor activities. For the warmer months there is an outdoor swimming pool right next to the condo. On the first floor there are three bedrooms and 2 bathrooms. There is a full bed in 1 bedroom, 2 twins in another, and a bunkbed and a twin in the 3rd. There is a stackable washer and dryer in the second bathroom. Walking in, there is a convenient mud room for all ski and snowboard equipment. The first set of stairs opens up to a spacious living room, dining room and kitchen with plenty of seating and a large wood burning fire place. A balcony is located off the dining room and the kitchen includes dishwasher, microwave, stove, refrigerator, cooking utensils and small appliances including coffee maker, blender, waffle maker and toaster. The third floor is a loft with a queen size bed and futon. It looks over the living area. The house is equipped with WiFi, basic cable, VCR, DVD player, movie and book collection, and board games. We love our home and know that you will too. Please contact us for any additional information. We love snowboarding and bought the condo because of the great location to not only Stratton but Okeemo and Bromley. We love the peace and quiet and as we grow our family and we love all the space and the slow pace of VT.
We loved the location. It is beautiful all four seasons and really enjoy the pool in the warmer months. It is also close to a couple of great bars and restaurants. The proximity to Stratton is our main benefit. It is also very close to Bromley which is open year round with an array of activities. There is also great shopping at the outlets in Manchester and lots of outdoor activities in the warmer months. Vermont is a beautiful state all 4 seasons! Extra sheets, towels and pillow cases are provided. Towels and washcloths are included. Two sofas are located in the living room and are low to the ground. Plates, cups, bowls and all silverware are included. Diining room table and a breakfast bar with stools are included. Basic cable and wifi included. Puzzles, Playing cards and board games included. Over 50 DVDs to choose from. Close to numerous Ski resorts and mountains. Stratton golf course is only 5 minutes awayy. This rental was one of our favorites, we always rent ski houses for New Year’s Eve and this home was perfect for our group of 9 adults. Huge open concept living space with a beautiful fireplace. Great accommodations with comfy beds and two baths, no frills. The house is very close to magic, Stratton, mt snow and bromley; as well as the town of Manchester for shopping and eating. Wood was provided and we could park as many cars as we wanted. Overall we had a great stay. Only problem was the oven or dishwasher kept beeping which got sort of annoying. Thanks for a great stay, we’ll be back! 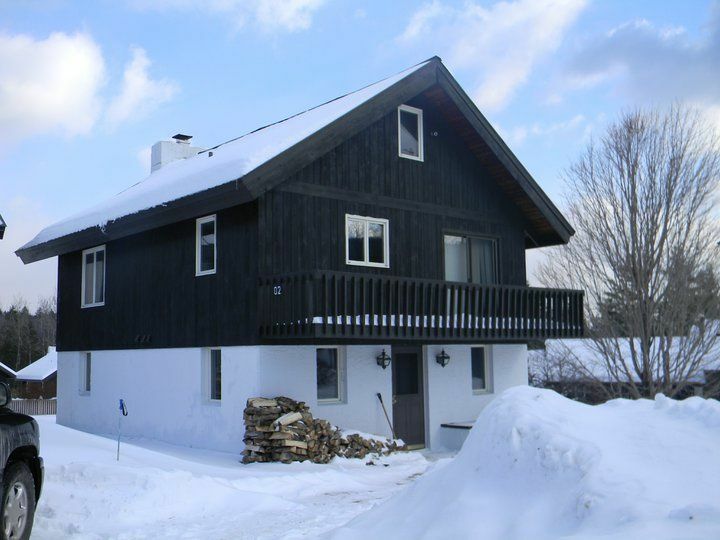 House is close to Stratton, perfect for our ski trip. It’s a beautiful vacation house. It’s was very clean and equipped great. Completely fits for the group of 9. And the host is very friendly and very responsive. The house was cozy and comfortable for 9 people in our group. The house is worn out but it’s kept clean. The sheets and towels were clean, kitchen had all the needed utensils and they had a bunch of movies that interests kids and adults. We really enjoyed our stay Beths place. The living space is beautiful with low seating arrangement which is good to hangout with friends and have fun. We spend most of our time in living area playing,discussing and enjoying. They have lot of games for entertainment. We reaaly enjoued playing twisters. Kitchen is well equiped.It is nearby to hikes and scenic areas.Thank you for having us. Being so close to the mountain offers year-round activities. Obviously there is skiing and snowboarding in the winter, but there is a ton of stuff to do during the other seasons. The condo is close watering holes for rafting, and hiking trails for hiking and biking. Stratton also has year-round activities including golf, concerts and festivals.